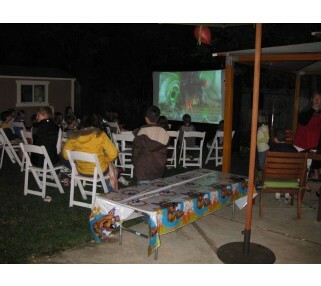 A complete backyard movie rental package for 50 viewers, incl. projector, DVD player, speaker & 9' screen. 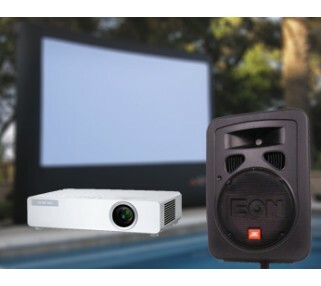 This outside movie projector and screen rental package provides everything you need for a high quality, outdoor movie experience for 2 to 50 people. Incredibly easy to setup. This package includes a bright projector, DVD player, a 9' wide by 5' tall inflatable projection screen a high quality speaker and all the cables you need. When you pickup your outdoor movie package rental, we will show you everything you need to setup and run the movie yourself. We back that up with 24/7 free phone technical support. Exact projector/speaker model may vary. 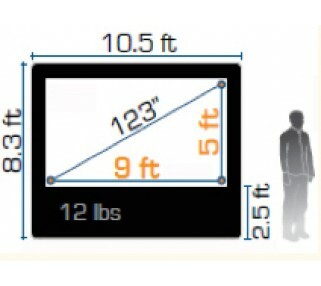 Minimum spec's include 2600 lumen projector with multiple video source inputs and a 200 watt self powered speaker.